Intel on Thursday officially initiated sales of its 8th Generation 'Coffee Lake' processors for desktops worldwide. The new chips offer more physical cores in the mainstream processor segment than their predecessors, but unlocked versions also come at $15-$20 higher MSRPs. As what usually happens with new products, the main questions are around whether the chips are actually available, and if the on-shelf prices are on par with manufacturer's suggested ones. In our searches so far, the new 8th Gen chips for desktops are not easy to get. For our availability and price checks, we use multiple well-known stores across the world as well as price search engines to ensure that we are not missing anything. It is important to note that most stores tend to sell products at their MSRPs on launch days, but going forward prices tend to fluctuate. Intel publishes prices as RCP (Recommended Customer Pricing). This is the price it gives for customers buying 1000 CPUs (a 'tray') as an OEM. Retail prices are often $5-15 higher depending on the configuration. We start our small availability investigation from the Core i7-8700K (RCP: $359), which has all chances to become a bestseller: the CPU has six cores with HT, a relatively high-frequency out of the box, and an unlocked multiplier. It sounds like a dream processor for an enthusiast that also wants to save money compared to a high-end desktop system. As it appears, the Core i7-8700K is hard to find. It is listed on Amazon, but as "currently unavailable", which is often not a good sign for overall stock levels. It is possible to pre-order the CPU model from multiple stores across the world, but it looks like their ETA is late-October to early-December, at least for certain stores in Europe. As for online auction sites, there are sellers demanding $800 - $900 per unit. Moving on to the locked Core i7-8700 (RCP: $303). This chip is slightly slower than the unlocked part out of the box, but offers a lower 65W TDP. The situation looks somewhat better for the non-K processor. The Core i7-8700 is not listed on any European Amazon site, but it can be purchased from B&H in the US, NCIX in Canada, and from Overclockers UK. The chips can be pre-ordered from multiple outlets (including Amazon US), but they are going to ship them sometime in late October or even in December, based on information from stores in Germany, Finland, and Sweden. Next up is Intel’s highest-performing CPU in the Core i5 range, the i5-8600K (RCP: $257). This CPU officially costs ~$100 below the Core i7-8700K as it works at a slightly lower frequency, but it also lacks Hyper-Threading and has a smaller L3 cache, meaning it will be slower in all types of tasks, multi-threaded or single threaded. Good news, it can be overclocked. A number of stores, including B&H, Newegg, ProShop, and CaseKing, are taking orders on the Core i5-8600K and promise to ship them by mid-October. In fact, B&H even claims that it has the chips in stock, but its delivery time is 10 days. Meanwhile in most cases, the Core i5-8600K CPUs are either not listed or are available only for pre-order with an unknown shipment date. The Core i5-8400 is positioned as a mainstream CPU for higher-end desktops that will be loved by both OEMs and consumers. This processor is the most affordable six-core CPU on the market today. It has an RCP of $182, which is significantly lower than $257 for the Core i5-8600K and $219 for the Ryzen 5 1600. This chip cannot be overclocked, but it still looks very good for its price. But can you actually buy it right now? Amazon UK U.K. £172 $225 Ships from U.S. Apparently, you can buy this chip. Leading retailers in North America either have the Core i5-8400 in stock or are about to get the first batch. You can also buy the chips from two retailers in the U.K. Meanwhile, mainland Europe is a mixed bag for the i5-8400 availability. You can grab the chip in Estonia from Arvutitark, but the company had 10 CPUs in total at press time — that is one unit per store in most of the cases. Meanwhile, CaseKing and ProShop Austria expect to start selling the i5-8400 in mid-to-late October. Some other outlets expect the inexpensive six-core Coffee Lake model to arrive in December. Moving down to the Core i3 range. For users considering Intel’s Core i5-7600K, the new Core i3-8350K is now an optimum target and significantly cheaper. The Core i3-8350K has four cores, runs at 4 GHz, has 8 MB LLC and an unlocked multiplier. Intel wants $168 for the i3-8350K and this pretty much looks like a bargain when compared to the i5-7600K ($242). Now, let’s check the actual availability and pricing of the new SKU. Amazon UK U.K. £164 $215 Ships from U.S. The Core i3-8350K is available from multiple retailers worldwide, but with a small overprice compared to its RCP as expected. That small overprice is common for other Coffee Lake models, but with the i3-8350K, it puts the SKU on the territory of the i5-8400. The latter is, of course, a non-overclocking CPU that runs at a moderate frequency, but it has six cores. Obviously, a lot of people will wonder which of the products is better for their workloads, but even users may be confused with the i3 and i5 overlap. The most affordable Coffee Lake model announced so far is the quad-core Core i3-8100, it costs $117 and can match something like the Core i5-7500 ($192) in terms of performance. Let’s check its real price and availability. For some reason, Amazon does not offer the Core i3-8100 at all anywhere, but you can get the product from various other retailers across the world. At least in the US, the price of the i3-8100 is not inflated because it is a new model or because the supply is tight. In other regions, you can either get it straight away or within a week, which means the stores may have a good supply of the chip. For many years, Intel has had a rather strict division between its unlocked Core i7 and Core i5 CPUs as well as Core i3 chips for mainstream desktop platforms both in terms of specifications and in terms of pricing. The Core i7 has always had four cores with HT as well as an 8 MB L3 cache, the Core i5 has featured four cores without HT as well as a slightly cut-down 6 MB L3 cache, whereas the Core i3 has integrated two cores with HT and 3 or 4 MB LLC. The launch of the Coffee Lake (Core i-series 8000 sequence) family adds two physical cores to all of the aforementioned product families, expands their caches, speeds up memory and brings in a number of other improvements — you can read about all of them in our review. The general principle that divides different product families remains the same though: the Core i7 has six cores with HT and a 12 MB cache, the Core i5 scraps HT and a part of the cache, whereas the Core i3 becomes a quad-core CPU without HT and a smaller cache. (Base) L3 TDP Cores Freq. When it comes to pricing, the situation requires some attention as it is a bit different from the usual. 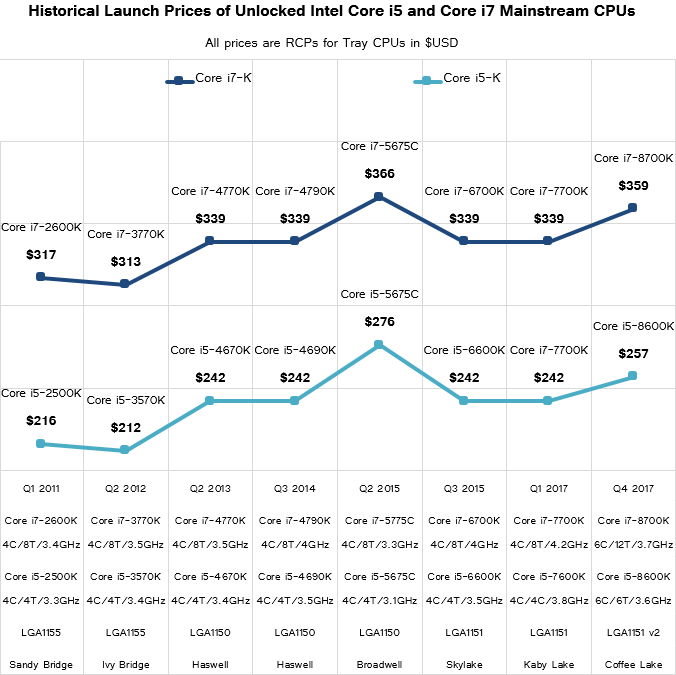 The locked Core i7-8700, Core i5-8400 and Core i3-8100 cost exactly the same amount of money as their direct predecessors (the i7-7700, i5-7400 and i3-8100). So, people getting those products essentially get two extra cores for the same price. Meanwhile, CPUs with an unlocked multiplier — the Core i7-8700K and the Core i5-8600K — run faster than their locked brethren out-of-box and can be overclocked further, but their RCPs are a bit higher than those of their direct predecessors. In fact, after Intel introduced its Core i7 and Core i5 CPUs with an unlocked multiplier in 2011, it has, for the most part, kept RCPs constant, except with a blip on the Broadwell CPUs (due to eDRAM) and now the upgraded core parts. Intel charged $313 - $317 for an unlocked Core i7 in 2011-2012, increased that price to $339-$350 in 2013-2017 and even sold an unlocked Core i7 with a powerful iGPU for $366 in 2015 (but since the Broadwell Unlocked was barely aimed at 'traditional' enthusiasts, we can ignore that). Likewise, Intel used to sell an unlocked Core i5 for $212-$216 in 2011-2012 and then increased their prices to ~$242 for 2013-early 2017 period (if the i5-5675C is not taken into account). Today, Intel increases pricing of the Core i7-8700K and the Core i5-8600K CPUs by $20 and $15 compared to their direct predecessors from the Kaby Lake family, a relatively small increase that fits into the trend. This is hardly surprising. Overclocking is becoming more popular these days, makers of motherboards tend to put a hefty premium on their high-end products, so Intel wants to get its slice of the pie as well. 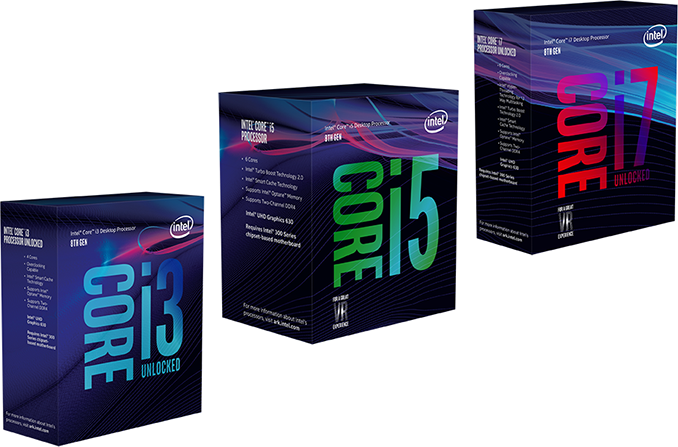 When it comes to the Core i3-8350K, it costs $168, which is in line with its direct predecessor, the Core i3-7350K. Keep in mind that Intel launched its first unlocked Core i3 earlier this year and these chips cost more than their brethren with locked multipliers did. Entry-level i3 overclocking is something new for Intel, but there is no MSRP change with the increase of the number of cores. Intel introduced its first quad-core processor for mainstream desktop platforms in 2006 with the launch of the Core 2 Quad Q6600. The company has been slowly increasing core count of its high-end desktop CPUs from four to six, then to eight, then to 10, and then all the way to 18 cores this year. Meanwhile, Intel’s mainstream desktop platforms have not seen any core count upgrade for a decade. Obviously, they have been gaining performance with microarchitecture enhancements, the addition of Hyper-Threading and other improvements (such as bigger and better iGPUs), but their physical core count stalled at two for entry-level and at four in case of higher-end parts from 2006 to 2017. With the launch of the Coffee Lake, Intel changes that. While Intel does increase pricing of unlocked Core i5/i7 CPUs compared to predecessors a bit, it does not do so with the rest of the family, adding cores at no charge. Probably, this means that the costs of the new Coffee Lake-S chips are not significantly higher than the costs of the Kaby Lake-S CPUs operating at higher frequencies, which possibly means that Intel’s 14++ (14nm-plus-plus) process technology is mature and the yields are high. Another thing to point out is that Intel significantly lowers per-core pricing of its CPUs. For example, the i5-8400 and the i3-8100 are available at $30 per core, down from $47 per core for the i5-7400 just a couple of quarters ago. The new Core i-series 8000-sequence CPUs require new Intel 300-series chipset based motherboards, so people interested in upgrading will still have to pay a premium for the new Coffee Lake platform. But at least there are now mainstream ($182 - $257) Intel CPUs with six cores as well as entry-level ($117) offerings with four cores. At these price points, the new processors for Intel are likely to get rather popular among consumers, especially those who upgrade from five or six-year-old platforms. Without any doubts, Intel’s official recommended prices for the new Coffee Lake-S parts look rather good if we compare them against RCPs of the Kaby Lake-S SKUs. Meanwhile, the big question is how much do the new parts actually cost in real stores and how widely available they are. This is something we are going to investigate in our next section. The new Coffee Lake CPUs represent a significant upgrade of Intel’s mainstream desktop products in terms of core count. The launch of relatively affordable Core i5/i7 models with six cores will catalyze many people to upgrade their PCs with quad-core CPUs, so we expect the 8th Generation Core i5/i7 products to be rather popular. The quad-core Core i3-8350K seems to have a lot of potential among overclockers, but its price is so close to the six-core Core i5-8400 that it will inevitably create some confusion. In the meantime, the quad-core Core i3-8100 brings a significant performance boost to the i3 range, so we expect the SKU to be in high demand too. Now, let’s talk about availability. The top-of-the-range Core i7-8700K model is not available from major retailers at all. Even on auction sites, there were only two sellers to offer this chip for $800 - $900 at press time. The Core i7-8700 is more readily available from large suppliers, but the majority of online stores cannot ship it right now. Availability of the Core i5-8600K is scarce, but some suppliers promise to have them in their stock sometimes in mid-October. As for the remaining three chips in the Coffee Lake lineup, the Core i5-8400, the Core i3-8350K, and the Core i3-8100, they can be obtained from multiple retailers, but not from all of them. As noted above, pricing of new products in their first days of availability tends to be very close to MSRP. We have noticed that some of the CFL SKUs are priced above MSRP, but the difference was not very substantial. The big question is how high the prices are going to get if demand for Coffee Lake exceeds Intel’s supply. Prices of Intel’s Coffee Lake-S CPUs Published: $400 for Core i7-8700K? Can't wait to replace my first gen i5. She served me well, still does, but now it's time for the long sleep. Sad really.